At the end of February AMD hosted its Capsaicin event where it waxed lyrical about the possibilities of its upcoming Vega GPU, a collaboration deal with Bethesda, and a partnership with game streaming service LiquidSky. 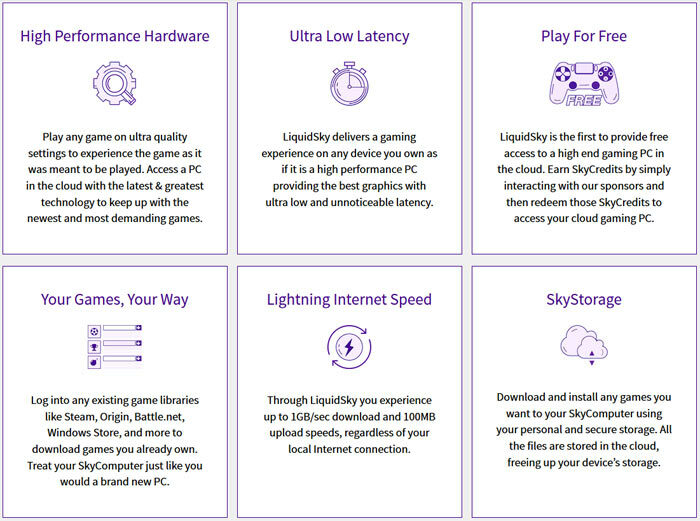 At the weekend LiquidSky moved out of its closed beta stage and proclaimed "the future of cloud gaming is here". To refresh your memories, LiquidSky boss Ian McLoughlin took to the stage at Capsaicin to talk about the hardware behind the impending launch of his new streaming gaming service. Even at that time, with LiquidSky in testing stages, it already had 1.5 million signed-up users. By 15th March, McLoughlin said at Capsaicin, it would bring online its shiny new Vega GPU servers to power its GeForce Now rivalling streaming service. At the weekend LiquidSky left its closed beta testing phase and entered open beta 2.0 with a new client program for Windows PCs. Now anyone can stream modern AAA PC games titles at 1080p 60fps+ in Ultra quality, as long as they have a Windows PC with a good internet connection and access to a game library. The plan is to have a client ready to enable the same gameplay on Mac or Android devices too. PCGamer reports that the out of beta service includes access to the newly upgraded server hardware. As you can see in the screenshot below, users can opt for a package with high-performance virtualised PC hardware at their disposal. One of the major hooks of LiquidSky is that it provides a free access level for modern PC game streaming. If you watch a 30-second ad (depending on world region) you can qualify for 40 SkyCredits up to a maximum of 180 free credits per day. 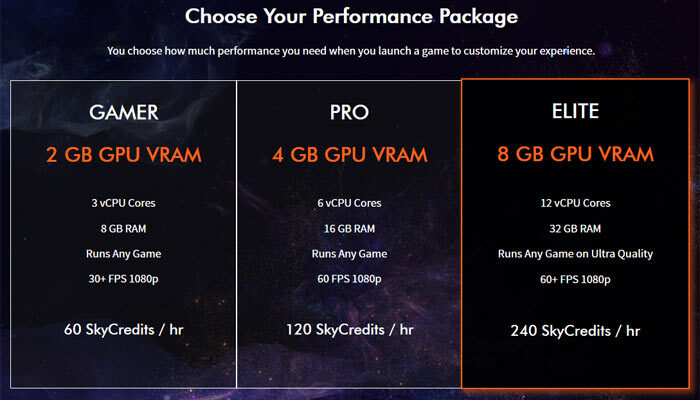 That gives you three hours access to the 'Gamer' level game streaming performance tier, or an hour and a half of the 'Pro' level 1080p 60fps tier. If the free credits aren't enough for you it's possible to top up with real money. For example $10 gives you 1,500 SkyCredits, and $30 provides 6,000 SkyCredits. LiquidSky also offers subscription plans where you get more credits for regular payment levels - e.g. $10pm provides 2,400 SkyCredits. SkyCredits roll over for up to 90 days. You will also want to consider the cloud storage levels offered with each package. PAYG users get 100GB cloud storage while subscribers get 500GB on any level. This storage is used to hold the games you already own and can sync via; Steam, Origin, Battle.net, Windows Store, and more. LiquidSky has apologised for the delays in migrating to new servers and thanked early users for patience and support. Looking at the Facebook pages it does still seem to be facing teething troubles. The company warns that the heavy load on servers due to the new open beta client being taken up could cause issues and asks for bug report submissions on the community forums. Reminds me of OnLive which had a very similar system. Unfortunately, although I thought Onlive had it in the bag, their business model meant that they were not making enough money. But the LiquidSky credit system sounds like the right way to go! This sounds very promising, but the installer crashes on my laptop. Oh well. Actually seems quite reasonable. So, I pay $30 for 6000 credits, for a streaming service I feel a lot of the super high end visuals will be lost in the video compression, and you are going to need a hell of a connection and a high end screen to be able to use the 60fps+ option, so the middle tier would be fine for pretty much anything. If you are going to be able to use the top tier, you'll most likely have the rig to handle the games natively anyway. Back on point, 6000 “points” at 120/hr would get you approx 42 hours of play time. so about 71cents an hour. The games would presumably install very quickly and you could access your whole library from your laptop wherever you could get a decent connection. Not for me, but very interesting. Honestly can't see it being a sustainable business, though. Edit: and dropping back to the cheapest option, you'd be playing any game on any low-medium (non-FHD) spec laptop/tablet for 35c an hour. Impressive. Well that lets a lot of people out of the equation in the UK then.